Cole Custer started third, finished 11th. Due to a jack bolt malfunction before the race, Custer was demoted to the rear of the field after the team replaced the broken part for the start of today’s race. Custer piloted the Haas Automation Ford to the top-20 in just 13 laps and battled just outside the top-10 before the stage ended. At the conclusion of the stage, inclement weather caused red-flag conditions for one hour and 34 minutes. When the red flag was raised, Custer pitted for four tires, fuel and adjustments to correct his loose-handling racecar. Custer started 12th, finished third to earn eight bonus points. After a solid restart, Custer built momentum and powered his Haas Automation Ford into the top-five on lap 62. On lap 83, the second red flag of the event was raised due to rain. When racing continued, Custer restarted in the third spot and maintained the position during the one-lap shootout. Custer pitted for four tires and fuel at the end of Stage 2. Thirteen other cars did not pit at the end of the stage. Custer started 15th, finished eighth. He re-entered the top-10 on lap 110. Custer pitted on lap 166 from the seventh position for four tires and fuel. After green-flag pit stops cycled through, he was scored in the eighth position where he ran until the race concluded. 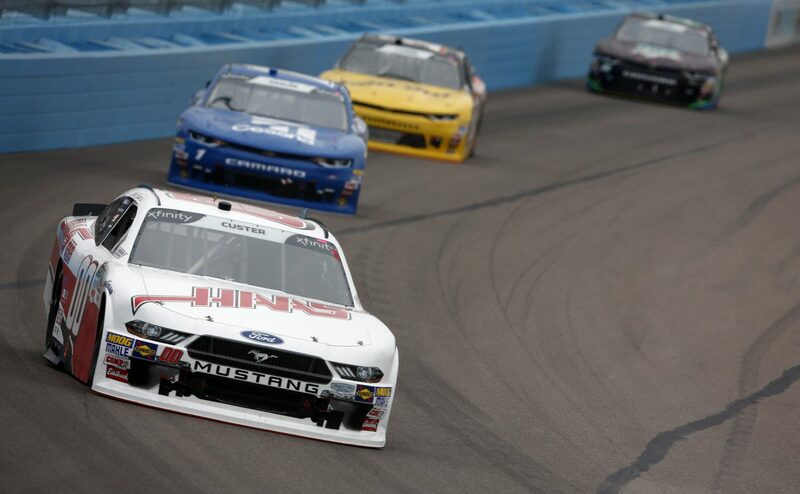 This was Custer’s third NASCAR Xfinity Series race at ISM Raceway near Phoenix. Today’s event was Custer’s second Xfinity Series top-10 at Phoenix and second top-10 of the season. Custer earned eight bonus points in the DC Solar 200. Only eight of the 40 drivers finished on the lead lap. Four cautions slowed the race for 24 laps. Brad Keselowski won the DC Solar 200 to score his 37th career Xfinity Series victory, first of the season and second at Phoenix. His margin of victory over second-place Justin Allgaier was 0.530 seconds.